Earlier this year, it was revealed that DC TV master Greg Berlanti (The Flash, Arrow, Legends of Tomorrow, Supergirl) was working with Warner Bros. Pictures on a Booster Gold film that would tell the story of the time traveling Michael Jon Carter. Zack Stentz (X-Men: First Class, Thor) who wrote an episode of The Flash in Season 2 and is now working as an consulting producer on the series, is writing the screenplay for the film which we learned back in May. 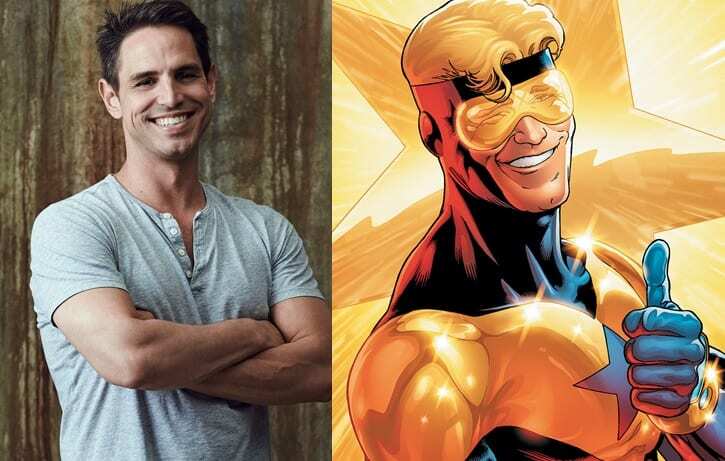 It has been pretty quiet on that project since then, until today as Berlanti revealed some very surprising details about Booster Gold when speaking with Vulture. While it was assumed that Booster Gold would be in the DC Extended Universe, it turns out that that isn’t the case at all. In the interview, he also revealed that the project came about after Berlanti and Andrew Kreisberg’s Booster Gold TV project “never got off the ground” on SyFy, as they got in discussions with DC Films president Geoff Johns. In an earlier interview, Berlanti expressed interest to possibly direct the film too. What are your thoughts on this? Are you disappointed that, as of right now, Booster Gold isn’t part of the DC Extended Universe? Let us know in the comments below. Why would they do that? The whole leg up DC has is they can use all of there characters. Putting some of them outside their cinematic universe makes no sense. Ugh. Awful. You have Booster and Blue Beetle, two awesome mainstays of the DCU and we won’t see these characters in live-action ribbing other heroes and villains in the DCEU? Stupid. I certainly hope it’s separate in the way Guardians of the Galaxy was, disconnected from the other movies but will crossover later. That’s why this movie won’t happen. WB is not going to give up one of their movie dates and approve $100+ million budget to a producer that has no experience directing and not even have it in the DCEU. The whole idea is pointless. If the script is decent, they should do an animated movie out of it. Damn Shame. I agree with the general sentiment stated here. This is a wasted opportunity. However, Berlanti did say “at this time”, so hopefully he & WB change their minds the closer to production this project gets. BG is not a fave character of mine by any stretch, so they are really gonna have to do something fantastic for me to get on board with this. DC has made a point to establish the multiverse concept with all of these properties. At some point all of these disparate shows and movies will crossover. It’s inevitable. If I believed that WB/DC had a plan I would be excited by the prospect of building a multi-verse and climaxing it in a Crisis event. However, everything they have done to this point displays a complete lack vision. Perhaps Geoff Johns can remedy that. We can only hope. It seems that people have embraced everything upon which Berlanti has placed his full focus. Two seasons of Arrow and two seasons of Flash have been very well received. Perhaps if he focused his energy on a feature film he could do something really enjoyable. Though, Booster Gold MUST be in the DCEU.